The Azores islands, the Lost World-esque archipelago located in the bluey midst of the Atlantic Ocean somewhere between Portugal and mainland United States has a near mystic persona shrouded around it such is it's isolation and it's breathtaking volcanic creation. 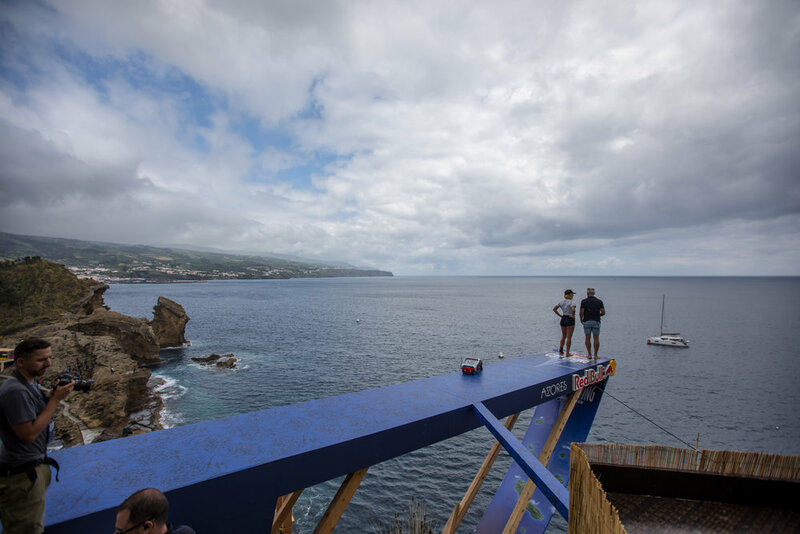 I set out on my way for the adrenaline-saturated Red Bull Cliff Diving competition in the Azores as part of Destination Red Bull, Red Bull's latest innovation which tailors once in a lifetime trips for normal punters like you and I to access coaching from some of their elite athletes in some otherworldly locations. Taking you to the front seat of a life on the edge with these athletes, and a coaching experience like no other. Somewhat of a self-professed cliff jumping junky myself, I was buzzing at the thought of not just being coached by the multiple World Champion, Cliff Diving Champion and arguably the most iconic figure ever in cliff diving, Colombian dive King Orlando Duque, but also at exploring this wildly lush isle, rich with out of this world activity, and nature roaring at it's finest. 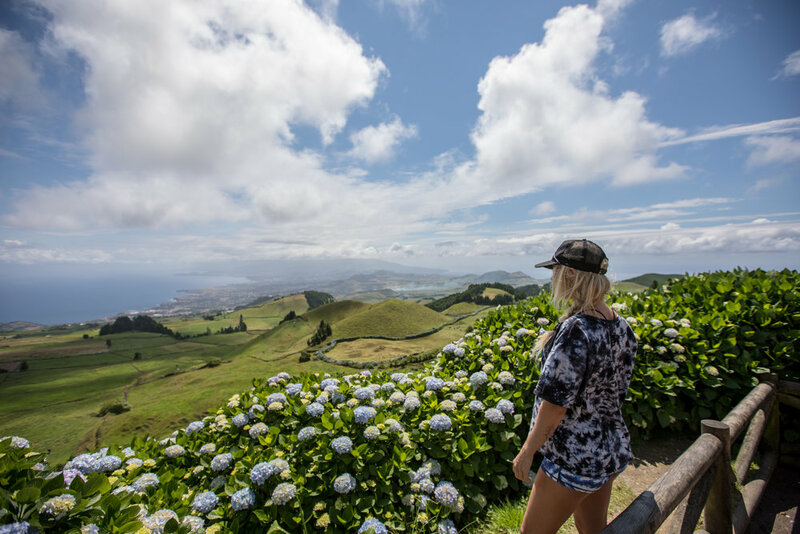 Sao Miguel island, our base for the week, is an adventure lover’s Valhalla, and our hotel the Santa Barbara Eco Lodge sits facing the Santa Barbara surf break, one of the best of the island, accessed simply by walking out your room and down onto the identifiably Azorean black-sand beach. There's something about the ocean here, where blue whales and some of the other greatest leviathans our planet calls home, so vast and blue, surrounding the Azores, lapping its rich hues onto the shore. 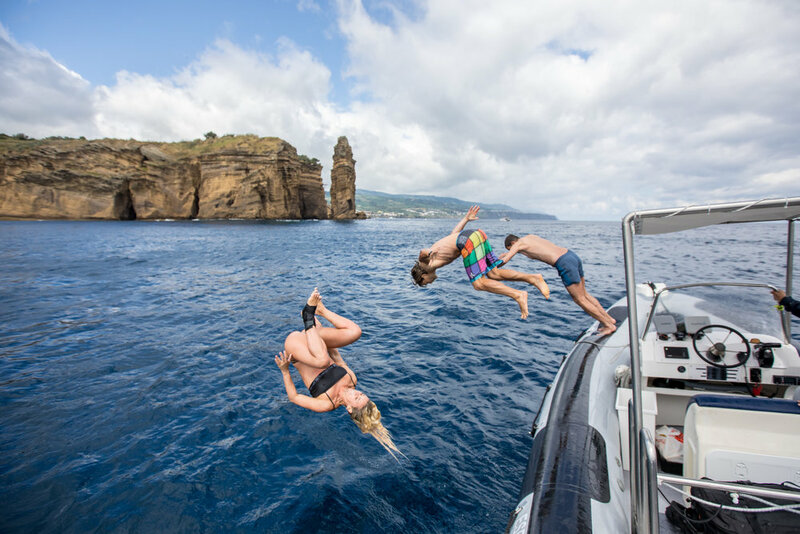 Scuba diving experiences here are immediately mind-blowing just for how magnificent the surroundings and the waters are, dropping your head into big blue, craggy black volcanic rocks and lush green forests in the distance, before entering the indigo planet below. My dive guide briefs me on some of the local residents I might spot in the depths, and as we drop to the reef, an explosion of curious fish and vast reef jungle below, she points down to the floor, and I am nodding in agreement, the deep blackness is beautiful. Suddenly I realize the black shape the size of a Jeep isn't the ocean bed, but the largest ray I have ever seen. I swim across it, feeling like a small mouse against a Goliath, it's beautiful stature unperturbed by my excited bubbles cruising over. Wide-eyed eels, puffer fish and barracudas swim indifferently as I am intoxicated by this subterranean world, breathless with excitement back on board the catamaran. 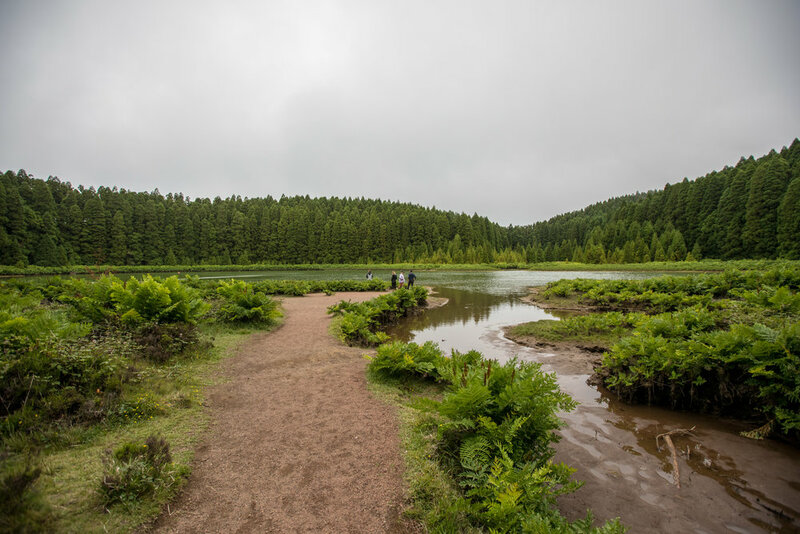 The Azores islands are really as well known for their cuisine as the wild adventure and great outdoors, and the entire week was heavily punctuated by some of the most incredible meals I've ever had. Nature’s larder here is so rich and pure, as we devour butter and garlic soaked dishes of limpets, juicy tuna steaks, grilled lobster and the like, every meal is one for the books. Our private coaching session with Orlando started as we pick up the decorated champion, a massively effusive, longhaired ocean Adonis, who quickly makes us feel at ease with the imminent jumps we know we are going to make. Tearing through the water, we spot a jet ski gaining on us fast in the distance. Suddenly boat-side with us, a Mich Buchanan worthy entrance by the Red Bull water safety team, who are with us during the trip to ensure our safety (they are the actual team who also onsite during the competition). Scouting suitable spots with Orlando, the craggy black rocks suddenly appear more intimidating as we arrive on the competition site island. We get a private tour by Orlando, behind the scenes the day before the infamous event starts. Feeling bold, we all agree that a 3 metre start jump isn't high enough, so head over quickly to the 7 metre jump. Peeking over the edge, surging blue waters below and water safety crew ready, I gulp slightly, such is the impressiveness of this spot, you nearly half expect pterodactyls to circle overhead. Some 1-1 coaching with Orlando and picking up some really handy tips, I make a jump for it, giving a thumbs up to the water safety crew who scoop me up on the ski, just like the athletes. Feeling the adrenaline surge through me, I can't help myself but head up for another jump, and as we peer up at the 27 metre deck where the athletes will launch off the in two days’ time, our minds are aghast at how it’s humanly possible to do it. Venturing further into the island for a deeper explore the next day, I continue to be blown away by the richness of the island’s nature. Mother Nature is really roaring at her wildest here, and with natural, massive and perfectly formed circles of flower bushes everywhere, deep green forests and rich, earthy soil beneath our feet, we excitedly delve deep into the island. Volcanic crater hole lakes shrouded in eerie fog, epic hikes to unparalleled view points and steaming natural Sulphur springs made for a full day of adventure, and as we soaked tired muscles in the volcanic springs at the end of the day, the mineral rich waters soothed aching muscles. Competition day on-site and we pulled up ringside of the event in our boat, so close to the divers’ entry spot, it's an event experience like no other. It's almost superhuman what the athletes are doing and until you see it up close, the height of the cliffs, how staggering the jumps and how precarious a take off some of the cliff spots are, you can’t believe it possible. The women's first dive spot entails a nail-biting looking abseil in their bathing suits down to a ledge that as we see them carefully move around to face the front, gap no wider than a foot’s length. The women's competition is fierce and we are collectively rendered speechless by the feats of the athletes. As they change spots in the afternoon to another rock, it is nearly impossible to comprehend how they are executing such technically astounding jumps. A number of them take off backwards, teetering on the edge of the cliff on their toes, perfectly controlled, poised, levels of strength, technical skill and grace that are incredible to behold. Leaving the site (and convinced I want to be a cliff diver), fluffy mouthfuls of famous local cake queijadas in our mouths, Orlando Duque's famous quote, “the moment you stop being afraid, you being to live dangerously” rings in my mind, spurring me on to keep pushing my limits, and to get out there.